Some kids will take to how their family establishes a Division of Responsibility in feeding without an issue. That’s because when kids are raised with an authoritative feeding style from the start (read more on what that is and isn’t here), it is all they know. Parents don’t have to spend time and energy “un-doing” the behaviors we want to avoid (see which ones here), but rather can instead invest that energy upfront to build a foundation for a healthy feeding relationship from day one. In most families, however, parents don’t discover the best practices for feeding their children until they usually find themselves in some type of a feeding rut. Whether it is a child who’s apprehensive towards eating altogether or one who throws a fit anytime non-preferred foods are offered, I understand how taxing it is on families when the approach we might have initially used with our children didn’t work out and so we are trying to adopt another way. Some children will go with the flow as you re-establish your family's feeding "rules." If you’re a parent to a child like this, consider yourself lucky and continue on course. In majority of families though, children will be reluctant to accept new ways of being fed and the learning it foods that come with such ways. That’s because after months or even years of being fed one way, the shift to accepting new roles and responsibilities in the feeding relationship is not always well received. That’s why in this post, I am addressing how to cope when transitioning to a new food parenting approach. Below, I share five ideas that will help get your child(ren) on board with this new feeding approach so that your whole family can come to experience less meal time stress and more feeding success. The first thing parents must remember is that these changes don’t happen overnight. While some families might choose to make an immediate transition to a Division of Responsibility in feeding, rarely will such families see all their feeding issues solved over night. That’s because as shared here, the Division of Responsibility in feeding is a best practice approach over time. This is not your get rich quick fix (if veggie consumption was our metric of money! ), but rather the feeding approach that will lend to your child’s long term success in forming a healthy relationship with food and your family’s ticket to more peaceful meal times for the many, many meals to come. I don’t feel like our meal times have been very enjoyable for us, so we are going to start doing things a bit differently. From now on, it is going to be my job to decide what food is offered at meals and snacks, when our meals and snacks happen, and where we eat. Every time food is offered, you will get to decide if you want to eat it and how much you’d like from what’s available. We are going to start practicing this at dinner tonight but it might take some time for us to together adjust. I am excited about us having more pleasant meal times as a family. How does all of this sound to you? While this might be beyond the comprehension level of younger children, you can tailor it as you see fit. The point to remember here is that you need to communicate with your kids so that the new boundaries and expectations are spelled out from the start. Even if your child seems too young to understand you initially, you will continue to reiterate your role versus theirs again, and again, and again over the coming years. So choosing to communicate it in a clear, concise, and consistent way from the start can give you scripts to go back to each time you are met with resistance (which you will be). Just as children need many reminders for other behavioral expectations to play nicely, wash their hands, and use their manners, they will need you to remind them about your family rules around this as well. So no matter how you articulate to them this type of transition, remember it is up to you to be decisive over this shift and to continue to reiterate it in a way that makes sense for your family. Some kids might not care that your pre-plate their food. For others, however, parents might see an obvious difference in their child’s response when they are given control over if/whether and how much of a given food goes on their plate. For more insights on if this is an approach that might be effective for your family, read more on family meals here. Consider starting with all love it foods. Some parents might find more success initially by practicing a Division of Responsibility in feeding with predominantly love it foods at first. As your child gets used to your role versus theirs, it becomes easier to then broaden the menu and include more of a Love it, Like it, Learning it approach. The aim here is to practice positive, productive feeding behaviors with foods that are less of a fight (being love it foods). Then, as your child and family adjusts to your new feeding approach, you can gradually start expanding on what is offered to include more like it and learning it foods. Engage your child in this process and allow them to help you meal plan. This way, as you begin to include them more in family meals that you know aren’t made up of all of their favorite “love it” foods, they will take comfort (i.e. push back less) in knowing there is always going to be something they enjoy offered. 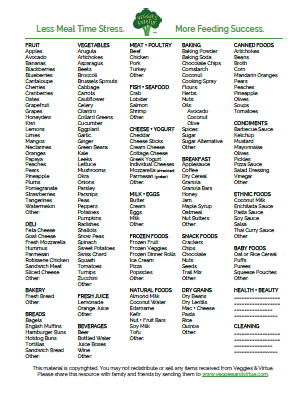 For sample meal planning templates to get started with, click here. One of the best ways to get more nutrition in your children even before they accept new “learning it” foods is by food chaining those foods that they are already familiar with. I show how to do this in each week of my Love it, Like it, Learning it group coaching. Specifically in week four of this six week email course, I guide parents through food chaining their child’s familiar favorites in a way that gradually introduces new like it or learning it foods. The goal here is for parents to realize how they can take their child’s “staple meal” (even if it’s mac and cheese!) and turn it into a nutrient-dense, family-friendly meal that’s full of variety and for everyone at the table to enjoy. My six-week group coaching program re-opens every two months. Find out more here. For many parent and child pairs in the feeding relationship, words have historically been used in ways to pressure and force feed kids into eating less of their love it foods and more of their learning it foods (more on this to come over the next two weeks) or to argue with one’s parents over the types or manner in which food is offered. That’s why circling back to the first tip in this post, we need to practice what language we should use moving forward AND which language we now need to avoid. Many of the phrases we might have become accustomed to using are no longer appropriate in a Division of Responsibility in feeding. Even if we as the parents are taking charge of what, when, and where eating opportunities happen, too often we hang onto the scripts that made us unsuccessful to begin with. This makes our kids unclear on how we are really going to react at meals when they push back. While this kind of testing is normal for kids (including in non-food related areas of life), it also tests our resolve to more fully put into practice a Division of Responsibility. For this reason, we need to be able to reiterate to our children the new dynamics of our feeding relationship. Without getting into a butting of heads or a battle at the table, we can remind them of the meal (and snack) time boundaries using clear, considerate language. While our kids won’t necessarily like how consistently we respond each time they resist our food parenting approach, the food-related battles begin to dissipate when parents can speak confidently to their child’s push back. This is why each week in my Love it, Like it, Learning it group coaching program, I provide sample scripts to accompany the weekly action item families are asked to implement. I want parents to have clear, concise scripts they can use with their children on a day to day basis that help both parents and children to be more confident ad calm in the feeding relationship. To sign up and get weekly access to these scripts, visit my Love it, Like it, Learning it group coaching program,. I have been at this approach with my own family for over four years now and we still face push back on occasion. That is just part of parenting - be it relating to food, discipline, limits on screen time, or doing things differently than our children would like. At different ages and stages and with the varying temperament of each child in a family, feeding with an authoritative approach can be more or less challenging. The key here is to remain both confident and consistent. You are doing a great job. Just take a deep breath, go as slow as you need, and know that a pleasant meal where nothing gets eaten is often more successful in the big picture than a clean plate achieved in conflict. Over the next couple of weeks, I will walk you through how to handle when your child only eats love it foods and how to better engage them with learning it foods (without force). You won’t want to miss these follow up topics to today’s post, so be sure you are subscribed to my newsletter so you get these in your inbox as soon as they’re live! What do you when a child only wants to eat their "love it" food? Take your role as nutritional gatekeeper to the next level with this clean-eating and family-friendly grocery list. All rights reserved. Veggies & Virtue LLC. Copyright 2017.